When British Airways and Iberia announced their intention to tie the knot a few years back, I simply didn’t get it. And I suspect I probably was not the only one. The smart and successful British Airways merging with the hopeless mess they call Iberia. 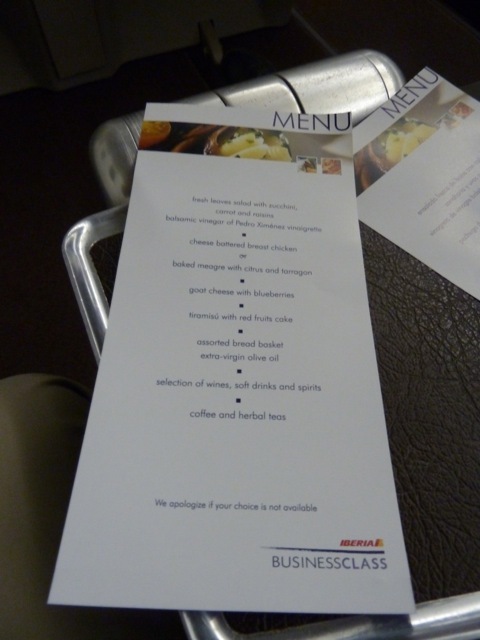 So far I’ve only ever tried Iberia in Economy Class and to be honest, they have yet to impress me. High time therefore, to give them a spin in Business Class. I will even be so kind and gracious and give them a bit of a head start. 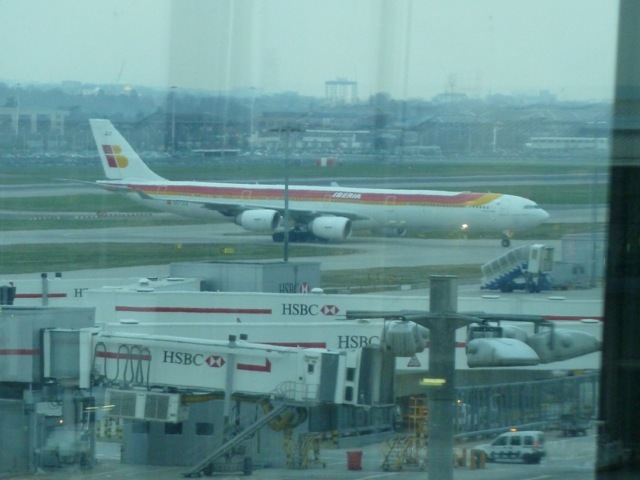 Rather than try Iberia on a ‘normal’ European route, I’ve selected the 18h40 departure from Heathrow to Madrid. 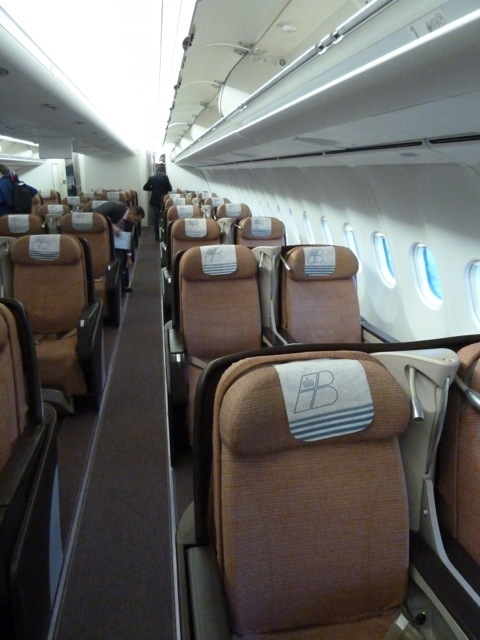 This flight is operated by an A 340-600 and thus promises a level of comfort that a narrow-body simply cannot match. So off we go. Iberia, do your worst! I’m already in Heathrow actually. I arrived here on a KLM flight from Amsterdam. 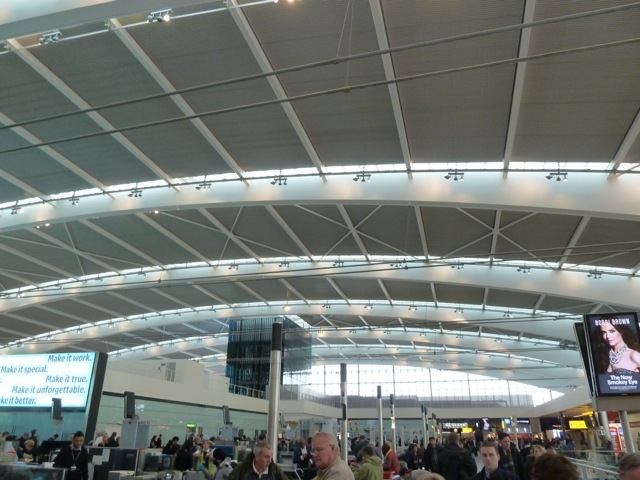 Heathrow is such a large place that it actually takes me over an hour to make the transfer from T4 to T5. 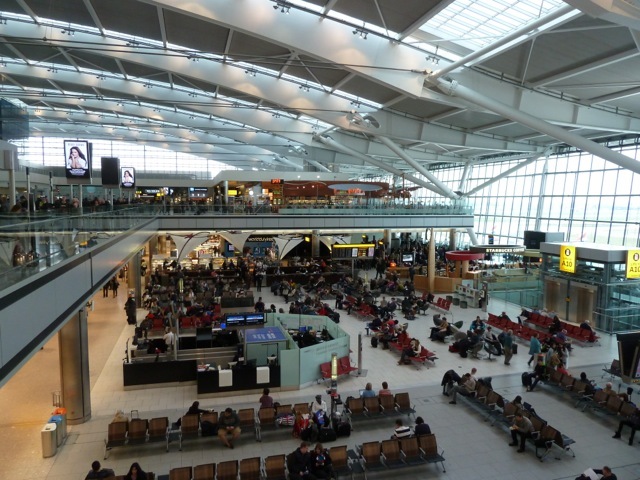 I’ve just passed security, which took ages. But I have only myself to blame for that. I forgot to remove my Kindle from my case and subsequently ended up having to unpack every thing and repack it again. I have just over two hours before my flight leaves for Madrid. But what to do? I’m feeling a bit peckish. I could go to the lounge obviously, and get myself something to eat and drink there. But if I do that, I’ll miss my bird arriving and I may not get a chance to take another picture of her. It will be dark by the time we get to Madrid. So eventually I decide to go for a meal at Wagamama. 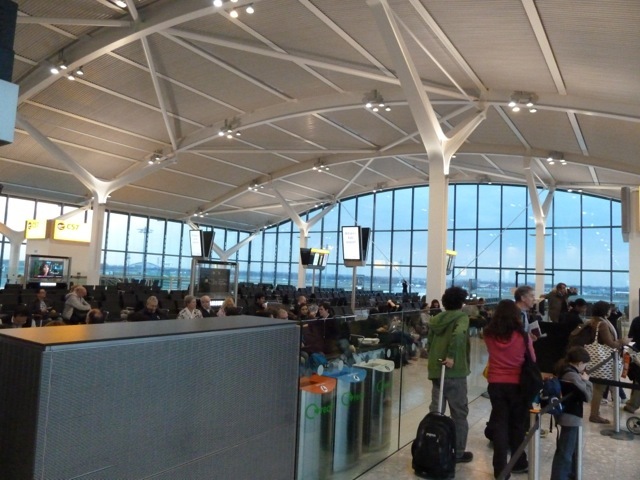 I like their food and from the restaurant I have a good overview of what’s going on in and around T5. I’m all set. I’m just waiting for my passion fruit cheesecake to arrive when suddenly I see the reflection in the window of something big and yellow. And sure enough, shortly afterwards the mighty A 340-600 comes into view and graciously glides down onto runway 09L. 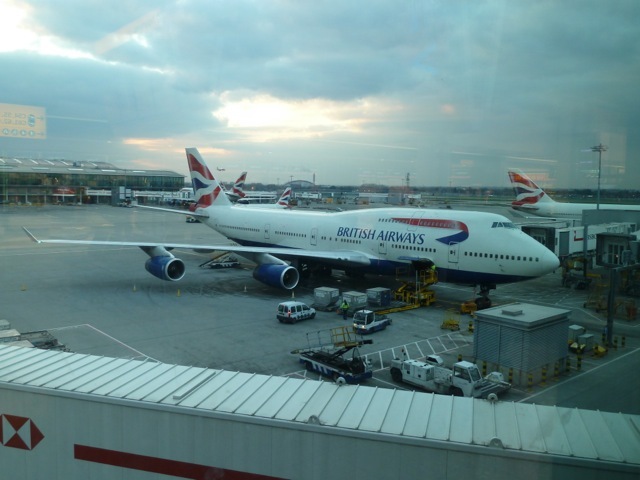 For some reason I was expecting the aircraft to use one of the gates at the main building of T5. It only occurs to me as I watch her taxi back towards the terminal that the A 340-600 may perhaps be too long to use one of the stands there. And indeed, eventually the aircraft comes to a halt at T5C, the second one of the two satellites. 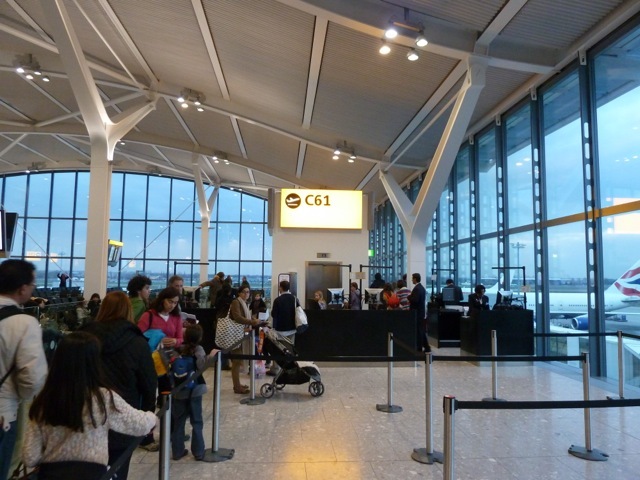 Just before six I pay the bill at the Wagamama and make my way to the gate at C61. 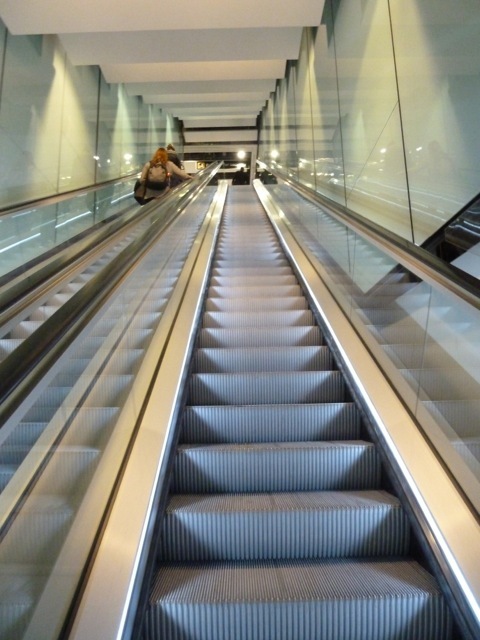 To do that I must first take a lift down into the basement of T5 and from there catch the automated shuttle. The shuttle calls briefly at the B satellite before continuing to the C satellite, the terminus station. As I arrive at the gate they’re pre-boarding families with children, of which there seem to be quite a few on today’s flight. 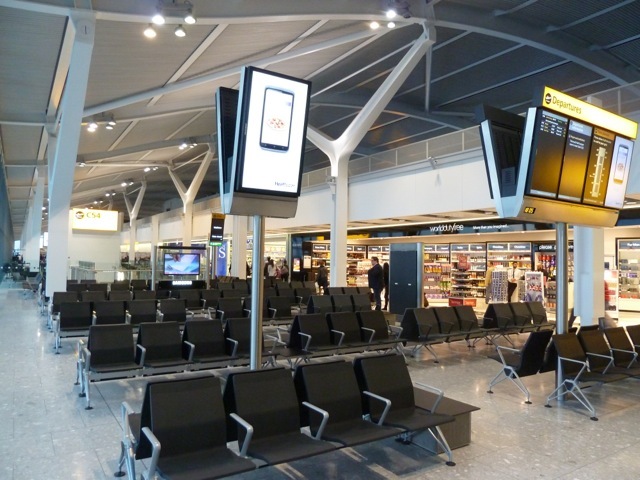 Next up, is the boarding call for Business Class passengers and frequent flyers with status. I am impressed by how strict the BA ground crew enforce the boarding process. It’s quite a trek from the exit of the building to the door of the aircraft. At least I get some excellent views of aircraft approaching and landing on 09L. Eventually, I reach the door and I am greeted by no less than three male flight attendants. They seem friendly enough. First surprise: the cabin looks rather nice. 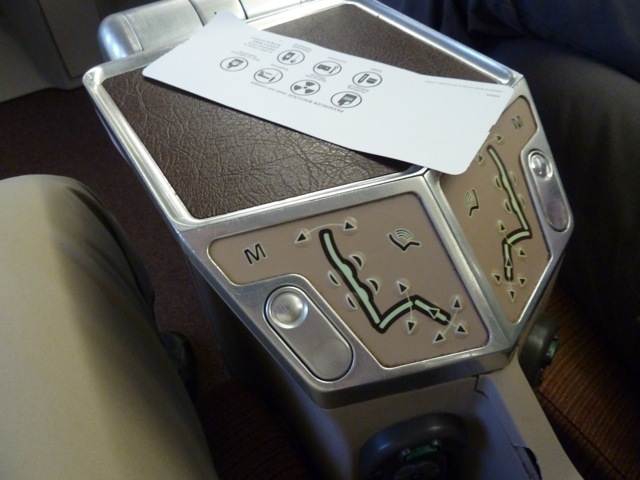 Admittedly the seat is not necessarily state of the art anymore. 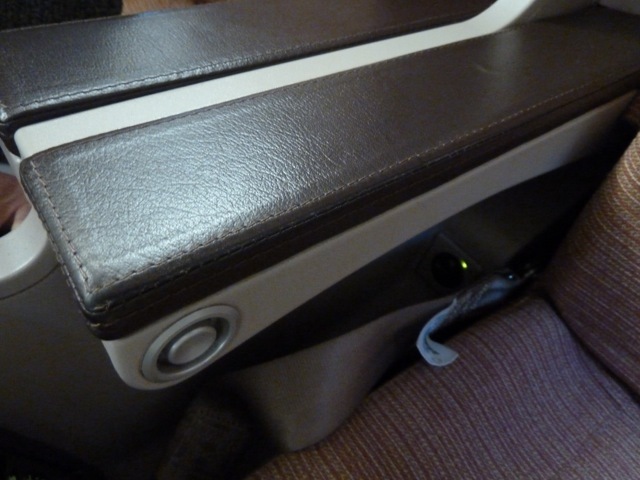 It’s what I would term something from the first generation of hard shell Business Class seats. 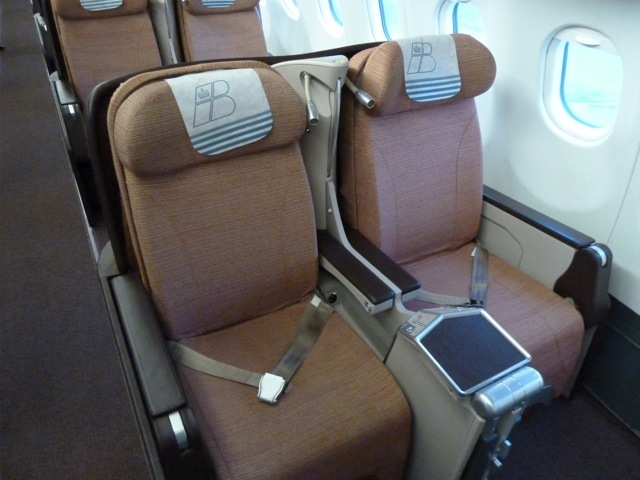 But still, the seat has a nice finish with leather (Or is it just plastic?) 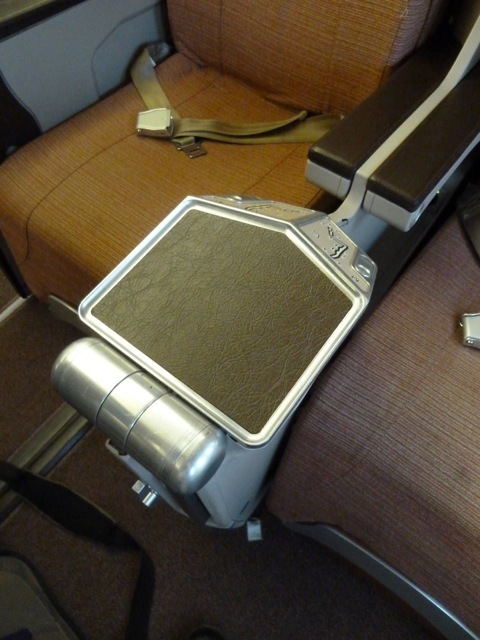 on the armrests and around the frame of the seat. More importantly though, when extended into a bed, it is indeed fully flat, horizontal and has a good height above the floor. 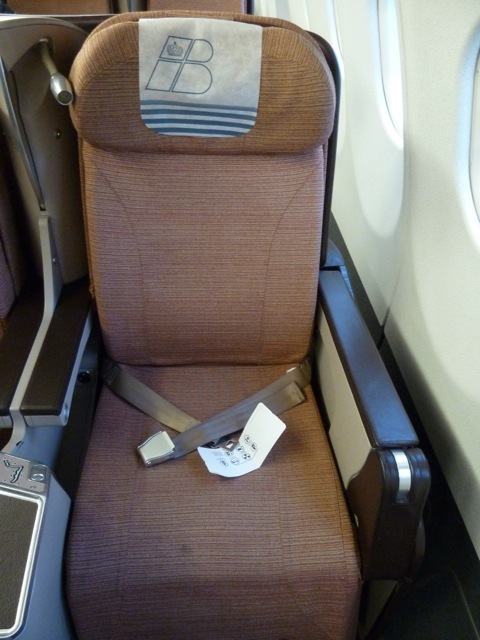 Would I be willing to undertake a long-haul flight in this seat? Yes actually, I think so and I would probably sleep like a baby. 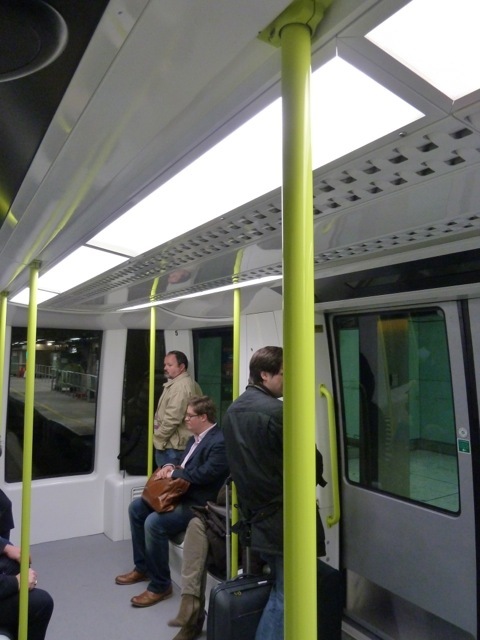 It is also worth pointing out that the aircraft as different luggage bins over the central row of seats. 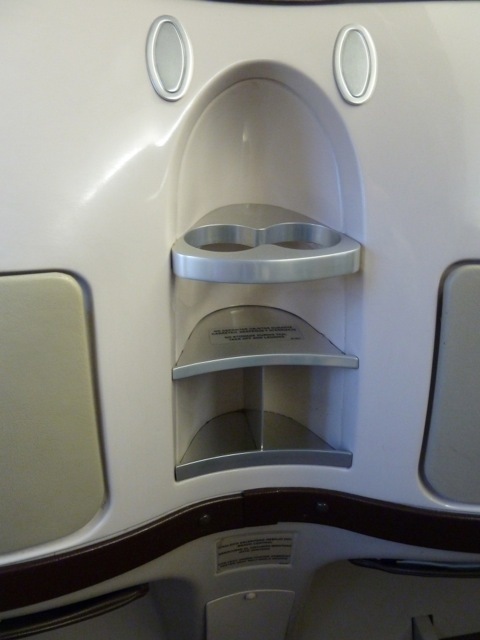 Instead of simply having a lid that opens upwards, the bins in the middle move down when opened, just like the ones used on the B 777 or the B 747. This is all wrong you know. I was expecting to not like anything at all about this flight! Departure is pretty much on time. It’s just before 19h00 and I am starting to feel tired. After all, it’s been a long day for me. I arrived in Amsterdam from Montreal at 07h50. 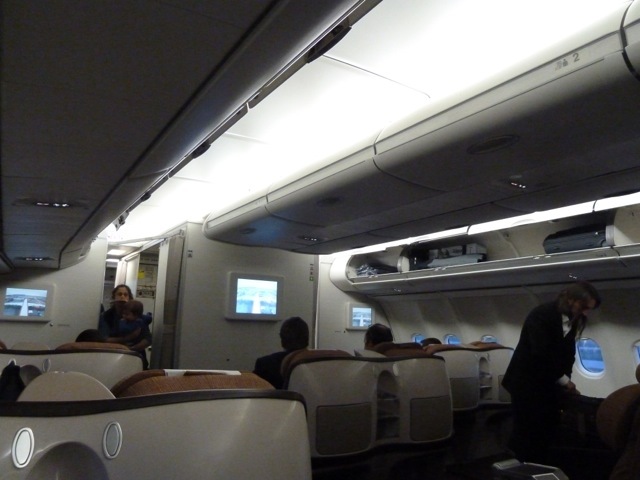 Although I managed to sleep very well, the flight was simply not long enough to get some decent rest. And then I spent the morning walking around Amsterdam before returning to the airport in the afternoon to catch the flight to Heathrow. So it’s hardly surprising that the unthinkable happens. For the very first time in my life, physical exhaustion gets in the way of my passion (That sounds so much better than obsession…) for flying. 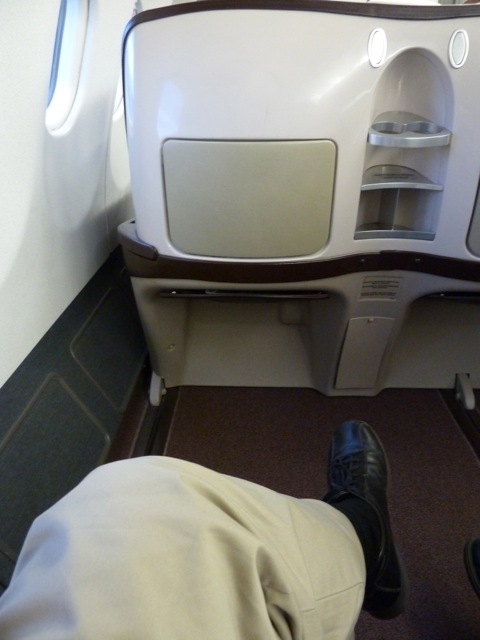 I nod off and actually miss our take-off roll – the best part of the flight. We go thundering down the runway and I’m happily dreaming away. One moment we’re moving backwards as we push back onto the taxiway, the next thing I become aware of is the flight attendant placing a menu on my armrest in preparation for the meal. I realise we’re already airborne. Well, at least I didn’t miss the food! 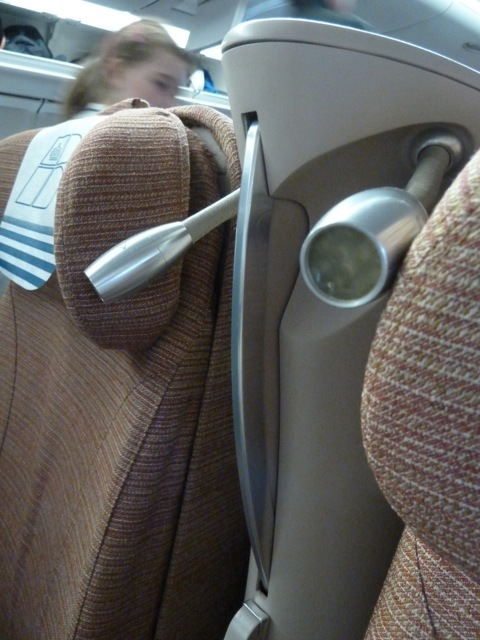 How many flight attendants are there up front anyway? There are two ladies working my aisle. One of them is young, friendly and efficient, while the other is middle-aged, very friendly and takes things at a much more leisurely, pleasant pace. Two middle-aged men are serving the other aisle. And then there’s another guy, I think he’s probably the purser, working the galley. Salad of fresh leaves with zucchini, carrot and raisins with a balsamico vinaigrette. 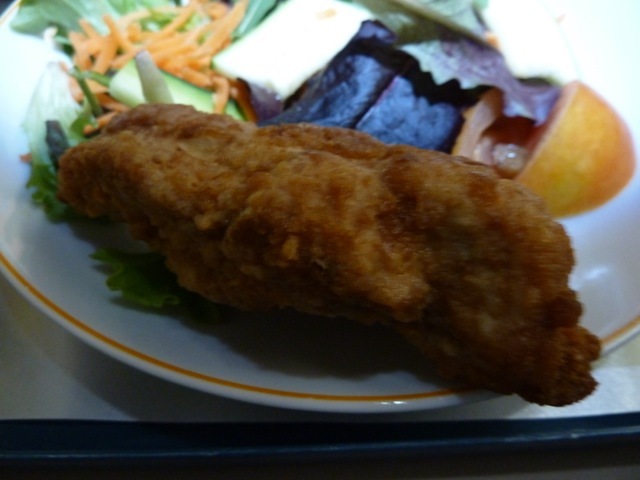 A choice of cheese battered chicken breast or baked merluza with citrus and tarragon. Tiramisu with red fruits cake. Assorted breadbasket with extra-virgin olive oil. From a glance at the menu it looks as though the salad and the chicken/fish are two separate dishes. 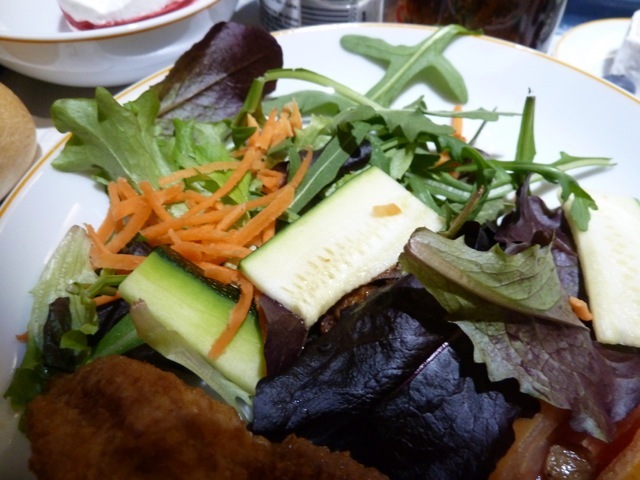 But in actual fact it is merely of question of having a warm item added to the plate with the salad. I opt for the chicken breast. 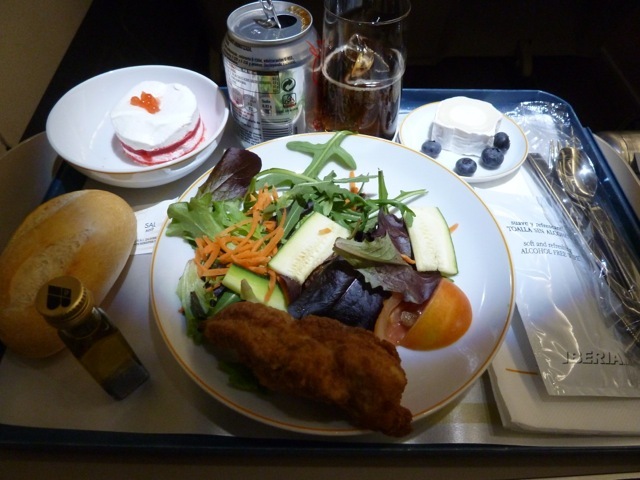 The meal if perfectly adequate for a flight time of only two hours and the taste isn’t bad either. The crew do two bread rounds. The only thing that is really vile is the dessert, the Tiramisu. Words cannot describe this abomination of artificial cream, artificial fruit flavour and probably also artificial bits of fruit. And then the trays are removed. 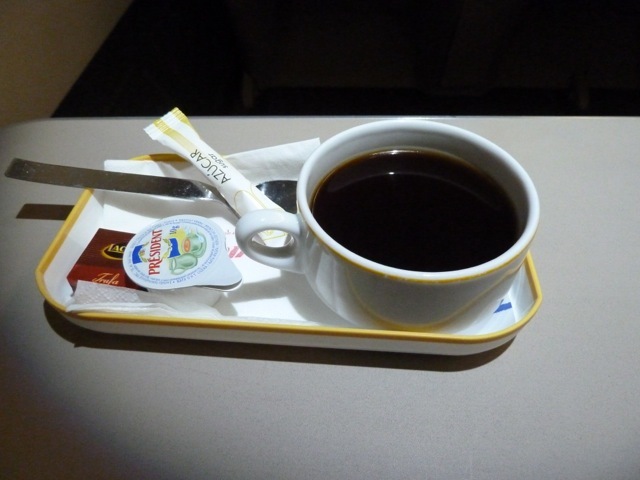 Coffee and tea are served on a small, flat dish. The crew proactively offer spirits to go along with that. As a rule I don’t drink on a plane so I stick to coffee and a glass of water. And then comes the moment for me to give the seat a trial run. I’m exhausted and really need to get some forty winks. 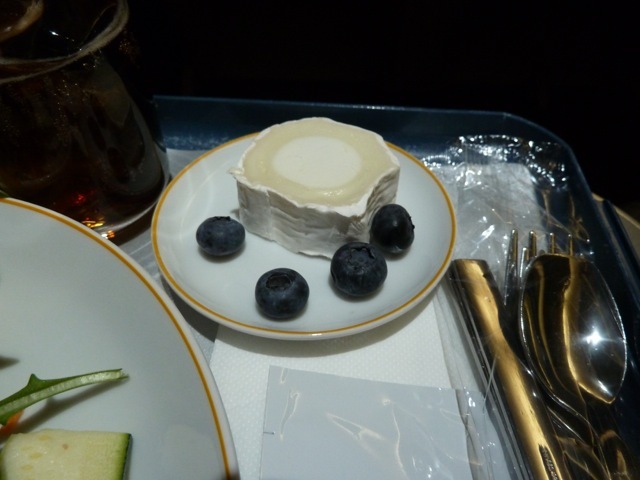 But again, my rest is but a short one as our mighty aircraft soon dips its nose and we begin our descent into Madrid. 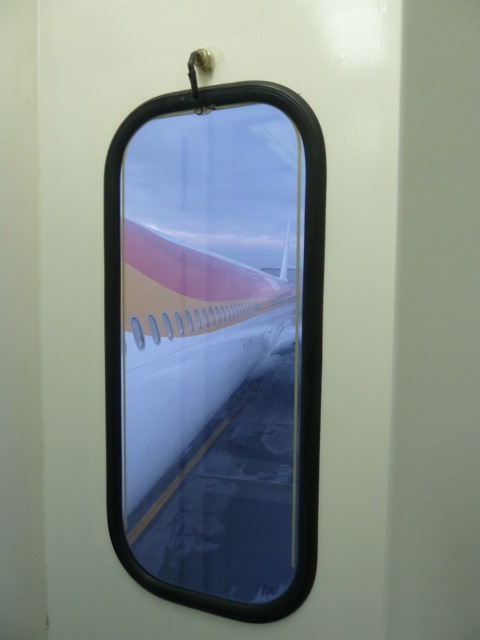 It’s rather cool of Iberia to keep the tail camera on for the approach. It’s dark by the time we reach Madrid so the runway is easily made out in the dark. Some passengers express their surprise as they notice that, although we’re moving in the general direction of the runway, the nose of the aircraft is in fact pointing in a slightly different direction. I think it’s called a cross-wind component. I only take one last picture as we disembark. Madrid’s T4 is certainly impressive but I am simply too tired to care. I’ll take some pictures of the airport on my way back to Frankfurt in a few days. We dock at the satellite. 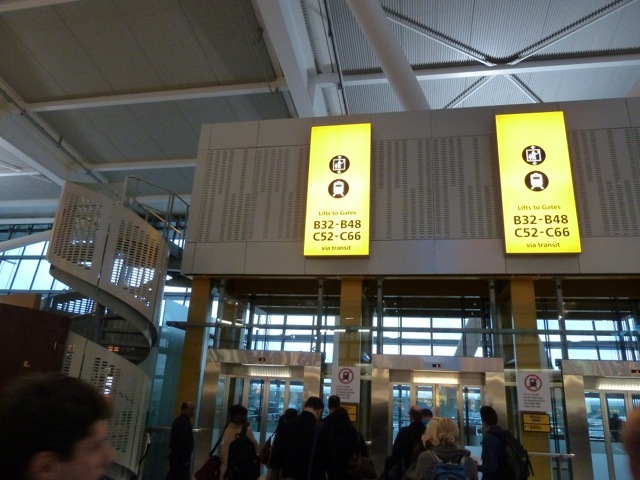 From our arrival gate it’s a walk of about five minutes to immigration. From there you take two sets of escalators down into the basement and then from there an automated shuttle to the main terminal. The shuttle journey is surprisingly long. Once I reach the main building I head for the Renfe station – the Spanish railways company. The journey from the airport to Atocha station takes about thirty minutes to complete and costs EUR2.50. I will spend the night at the Radisson Blue close to Atocha station. Tomorrow I will catch a train and spend Easter in Toledo. What can I say? 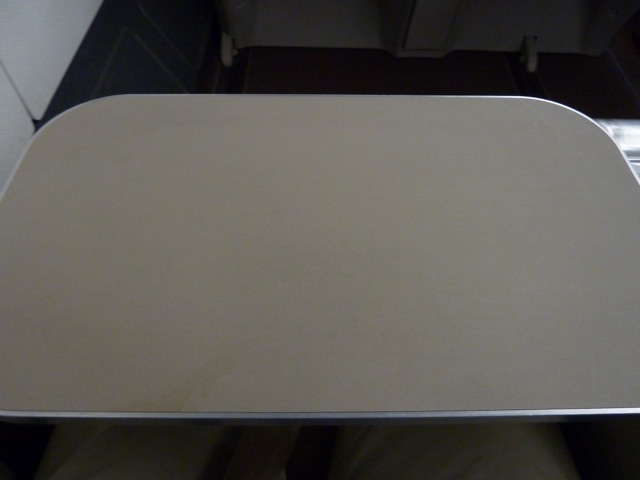 I was really not expecting anything much from Iberia other than horrible service, bad food and worn hardware. 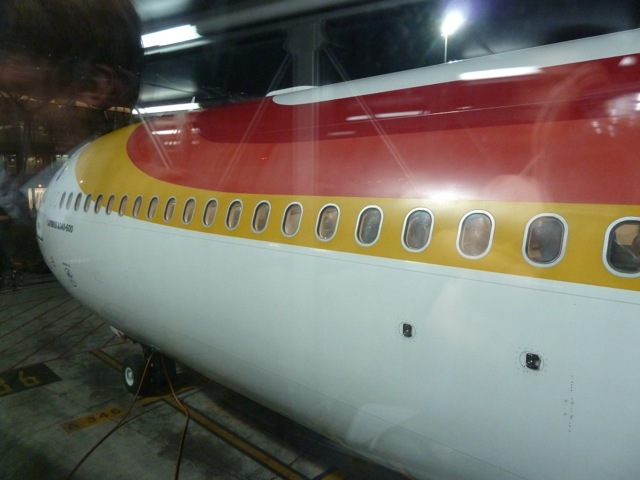 But in fact Iberia exceeded my expectations. 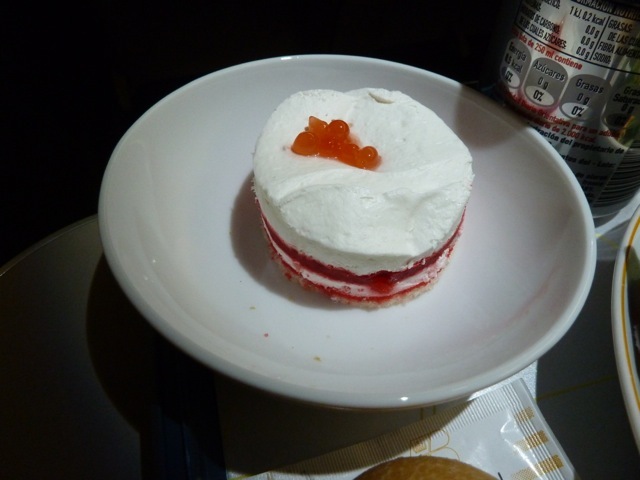 The seat was comfortable enough, the crew were polite and friendly and the food was okay, save for the dessert. Having said that, the whole experience was certainly not outstanding and seemed somehow very old-fashioned to me. 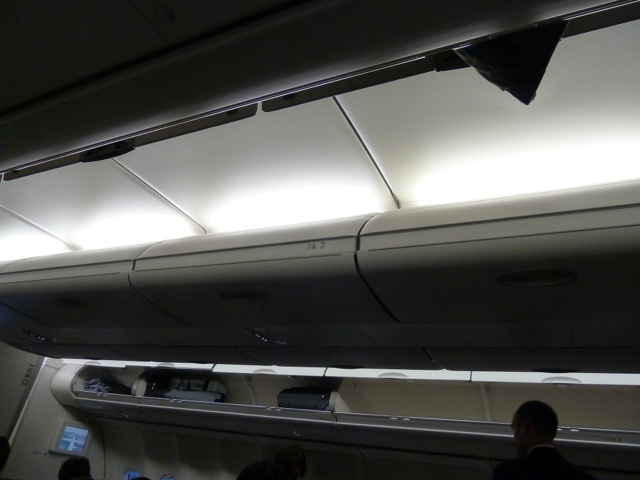 So perhaps it is just too easy to simply say that Iberia is a horrible airline with bad service. Perhaps it might be more appropriate to say that Iberia is an airline with a product and service that are simply not competitive anymore. 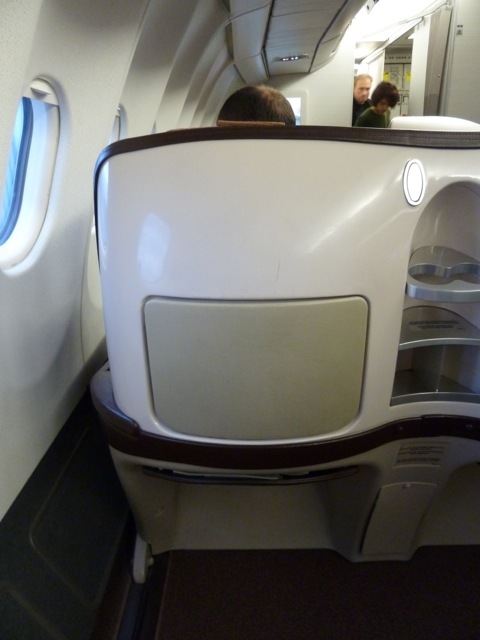 This entry was posted in Airbus A 340-600, Business Class, Iberia and tagged airbus a 340, airlines, aviation, british airways, business class passengers, business class seat, departure gates, flying, london heathrow, transportation, travel, vacation. Bookmark the permalink.